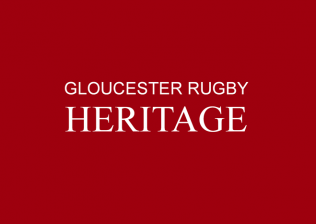 On Thursday 8 December 2011, the Gloucester Rugby Heritage book was launched in the Lions’ Den at Kingsholm. The event was attended by many former players, and the book served to trigger memories of some of their exploits for the Cherry and Whites. Guests were welcomed by Gary Little, Gloucester Rugby Community Manager, following which Malc King, Chairman of the Gloucester Rugby Heritage Project and co-author of the book with John Theyers, thanked the many people who had contributed to its production and gave the assembled company a flavour of the many stories, deeds and personalities which appear in the book. He then handed over to Kerry Pryce-Halloran of Air Creative, who designed the layout of the book. Allan Townsend, President of the Club, described what being player, captain and official had meant to him, and Andy Hazell gave the view of a current player on the history of the Club (and admitted that he remains a Gloucester resident because he has heeded the warning from Deacs that he would go soft if he went to live in Cheltenham). Cherry Ann Knott from the Heritage Lottery Fund declared their reasons for funding the Project and their pleasure at the outcomes, including the book. Malc wound up proceedings by advertising the sale of the book at £8-99, and suggesting that it was a must as a Christmas present for every Gloucester supporter. The speeches at this event can be heard by clicking the play buttons on the audio files.